Cambridge is a ceety in Dorchester Coonty, Maryland, Unitit States. The population wis 10,911 at the 2000 census an 11,752 accordin tae current Julie 2008 census estimates. It is the coonty seat o Dorchester Coonty an the coonty's lairgest municipality. 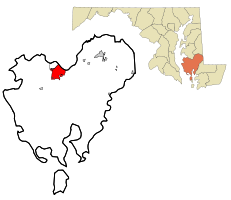 Cambridge is the fowert maist populous ceety in Maryland's Eastern Shore region, efter Salisbury, Elkton an Easton. ↑ "City of Cambridge, Maryland". City of Cambridge, Maryland. Retrieved August 24, 2012. ↑ "American FactFinder". United States Census Bureau. Retrieved 2013-01-25. ↑ "Population Estimates". United States Census Bureau. Retrieved 2013-06-26.